We all knew it was coming…a Nano racer from JJRPO. JJRC branched into JJPRO recently and started making racers. They made a few brushless racers that got mixed reviews; but with the rise in popularity of Nano racers, it was inevitable that we would see a Nano racer from JJPRO. 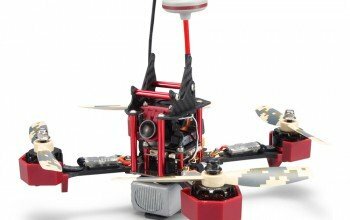 It’s named the T1 because it’s the first Nano racer from JJPRO, and they put a lot of work into making something that could compete with Eachine racers—both in performance and price. It looks similar to the Eachine QX80, but it’s also different in a lot of ways. The main features are low cost and compatibility with Spectrum and Tarranis transmitters plus a higher resolution camera. The 800 tvl camera has a higher resolution than most Nano FPV racers, and it’s not like Eachine cameras. It has a plug instead of being soldered in place. I honestly prefer to have the camera soldered in place because it causes less interference. The range and picture were fine, but I got more static interference than I would like. It wasn’t anything that made it hard to fly, but it was obvious that I should remove the plug from the camera and hard solder it into place. This aircraft looks a lot like the QX80, but it’s a lot more refined. It has an extra CF plate on the top for protection, the main frame is larger and more robust, and the camera is repositionable. The camera lens is also longer than most, and the motors make a higher pitch sound than most motors. The overall look isn’t bad, but the choice of colors on the stock propellers is a little ugly. It’s a durable aircraft with a strong frame, but the motors are soldered in place along with everything else, so replacing parts will require a little soldering. Overall, they did a good job with the design; the choices make sense and help make it a quality aircraft. The aircraft comes in a nicely padded foam box and includes a single battery and a few spare parts like propellers and motor grommets. You’re going to need a transmitter and a pair of FPV glasses, and they only offer two options when it comes to transmitters: Tarranis or Spectrum. You can get a FRSKY receiver version and fly it with your $200 Tarranis transmitter, or you can get the DSMX/DSM2 version and fly it with a lower cost Spectrum transmitter. I went with the DSMX/DSM2 option and borrowed a spectrum DX6i transmitter from a friend. Binding to the aircraft was easy. Just plug in the aircraft’s battery and wait 10 seconds for the receiver to go into bind mode. If you are using a DX6i transmitter, hold the trainer switch up and turn the transmitter into bind mode. The aircraft and transmitter should bind instantly. That’s the easy part. Next comes the hard part: getting all the channels to work properly and getting the aircraft to arm. Everything was on the wrong channel. When I hooked it up to clean flight and took a look at the receiver tab, the throttle stick was controlling pitch, the pitch stick was controlling yaw, and so on. I had to go into the command line interface and experiment with a few different MAP commands before I came across one that worked. Map AETR1234 means map the channels so that the aileron is on Channel 1, elevator is on Channel two, throttle is on Channel 3, and rudder is on Channel 4. After I got that straightened out, I had to figure out how to get the aircraft to arm and disarm. The instructions said it used the traditional throttle stick down and to the right to arm and down and to the left to disarm. Unfortunately, that did not work. I eventually ended up going into clean flight and going to the mode tab and programming an arm-disarm switch as the auxiliary Channel 5 switch on the transmitter. I was able to see the switch was working in clean flight, but the range was off, meaning I would flip the switch and it would register a value that was too high or too low for the flight controller and receiver to process. I had to go into the menu of the DX6i and change the travel adjustment of the throttle to 125%. Then I had to lower the up position of the auxiliary Channel 5 switch to 80%. After all that work, I was finally able to arm and fly the aircraft, but something seamed dramatically off because it didn’t respond quickly and wasn’t able to fight any wind. After doing some research, I figured out that the problem was with the DX6i dual rate expo settings. I had to change the stick sensitivity to negative 100% in all three of the second columns of the dual rate expo tab. This gave me full stick sensitivity, and so I was finally able to give the aircraft a proper test flight. It was a rather complex procedure. I had to learn a lot about the DX6i and receivers to get it to work. It took several days and a lot of perseverance. I have 10 years of RC experience, and I still had trouble with it. Perhaps it’s easier if you use a Tarranis transmitter. I think that is what the designers like to use. The manual is a single page of instructions that barely make sense. Both the translation and the information being conveyed are convoluted and confusing. I’ve been doing this for 10 years. Someone sends us an aircraft, we test it, make videos, and write reviews. Sometimes we get to keep the aircraft, and sometimes we have to sell the aircraft to make ends meet. Unfortunately, the JJPRO T1 was one that we had to sell. I spent 60 to 80 hours getting a transmitter, programming it, and tuning it. Unfortunately, I was only able to have a single 5-minute indoor flight with it before I had to sell it. From what I could tell, it did just fine. It turned nicely, stopped nicely, seemed to get decent range, and was quite durable. I wanted to test it outside to see how fast it could go and how well it could perform. From the indoor test, it felt just as capable as a QX90. There was only one flight mode pre-programmed, but during the tuning process I programmed several different PID settings and mode settings. I was able to program an angle and horizon mode for it, even a full acro mode, but I didn’t get to test any of them. It was surprisingly robust in the amount of ways it can be programmed to fly. Like I said earlier, I think the engineers that made this aircraft like to use Tarranis transmitters, and you would probably have an easier time with it if you get the Tarranis FRSKY compatible receiver version; but Spectrum transmitters are just so much cheaper that it might be worth a little channel and switch mapping work if you want to save a few hundred bucks. Since this is a JJPRO aircraft and not an Eachine aircraft, there is no FLYSKY receiver option. You won’t be able to use your fsi6 transmitter unless you install a Frisky or Spectrum transmitter module into it. I think the camera itself is awesome; however, I’m not sure about the connection. I got a lot of static and had to go through a number of channels before I found a clean one. I think a hard solder connection would give you a better signal. The field of view is fine, and it handles low light conditions. It’s also one of the few Nano racers with a repositionable camera angle.Conclusion. This is a decent entry into the world of Nano racers for JJPRO. It’s not a clone of other racers, and they worked on each component to make it unique and important. It would just be nice if there was a FLYSKY receiver option available.